I know, I know, I’m behind on this cultural phenomenon. By now everyone and their grandmother has read The Hunger Games by Suzanne Collins. See, I get a little turned off when something becomes an explosive, all-popular cultural phenomenon; I don’t know if it’s because I don’t like to buy into what everyone else is doing or because usually it’s something stupid like Twilight, but this time around I went ahead and gave in. Good thing I did! The book is not a masterpiece of literature by any means, but it is a highly entertaining young adult book with dark themes and violence and the exploration of dystopia that adults can enjoy as well. I suspect books like these become big hits because many adults are too lazy/stupid/impatient to wade through something at an adult reading level, so they latch onto quick, easy reads with a fast pace and high entertainment factor. In this case, there’s nothing wrong with that, since The Hunger Games is a good book. The writing style is geared towards young adult readers but is smooth and polished, with content that is meant for the high school level and above. It’s told in present tense, which amps up the tension and cements the reader in the current moment. 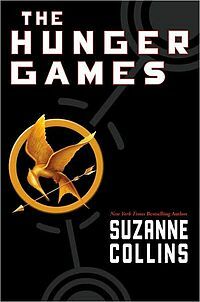 Our heroine, Katniss, makes me pleased that this book is as popular as it is. 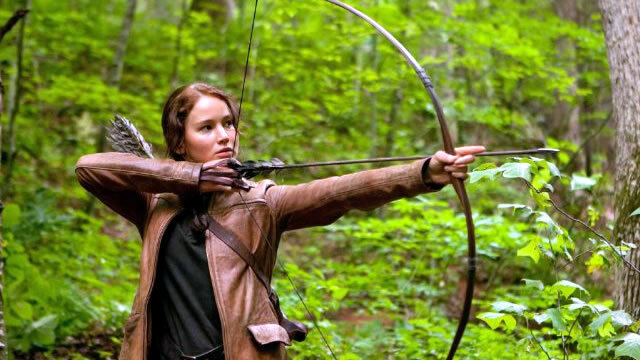 Katniss takes the damsel-in-distress trope and turns it on its head. She is fierce, independent, stubborn, great with a bow-and-arrow, and she ends up saving the male lead more than the other way around. My middle name is Badass. In case you’re living under a rock somewhere, the Hunger Games are a gladiator-style competition in a future dystopia where America has collapsed into a new country called Panem, comprising of a Capitol and 12 districts. After a failed uprising, the Capitol decided to put all of the districts in their place by creating a yearly battle royale between children ages 12-18, where 2 are chosen from each district (one male, one female) to fight to the death. The last one standing is the winner, and the competition is televised to the entire country, mainly for the entertainment of the shallow residents of the Capitol. It’s gruesome. The children die in horrible ways, from getting speared to poisoned bee stings. Katniss finds herself thrown into the arena with Peeta, the boy from her district, who has a crush on her. They get through the tournament by playing up a half-fake romance (for the Capitol’s entertainment) and through the hunting skills that Katniss has developed over years of feeding her poor, starving family. The reason the romance actually works in this book (as opposed to, I don’t know, Twilight?) is that it happens naturally and does not take over the plot. Peeta really does like Katniss, but Katniss herself struggles to pretend to be in love with him for the cameras all around them. She does grow fond of him, of course, but it is not some ridiculous love at first sight nonsense. She has a good head on her shoulders and is simply trying to survive the Games. I’ve only read the first book, so I can’t say how this continues to play out in the sequel. Many people probably enjoy this book for the romance factor (blargh), but I appreciated the well-handled elements of horror and sci-fi along with the strong feminism that many current romance-driven books seem to lack. There is much more to Katniss than romance; in fact, she herself admits that romance is the least of her concerns right now, as it should be. She doesn’t want to get married, and she doesn’t want to bring children into the world only to have them potentially get pulled for the Hunger Games. I like this girl. This is a heroine I can get behind. Read The Hunger Games now! I hear tell the two sequels were rushed and consequently aren’t as good. But in any case, it’s nice to hear that you think this novel is deserving of its popularity. I think I’ll take your word for it. She’s not who I would have picked, but I think she’s much bteetr than some of the people whose names were being thrown around for the role. She was excellent in Winter’s Bone and I think that proved she could get down and dirty for a role. We’ll see how she does.Melissab4s last post ..
I’m more annoyed about how ehivytreng resolved suddenly, in one page at the very end. I wish there could have been something just a little earlier with Katniss and Peetah so it wasn’t just “oh, okay. that’s random” making up one or two lines in the last page. I felt shortchanged, not satisfied at all.